An organization formed 50 years ago to preserve one of the most biodiverse lands in the world -- the Big Thicket of southwest Texas -- is holding its first kayaking and canoeing event Saturday in Beaumont. The executive director of the Big Thicket Association, Bruce Walker, says paddlers will go upstream on the lower Neches River to explore oxbow lakes during the Neches River Rally. 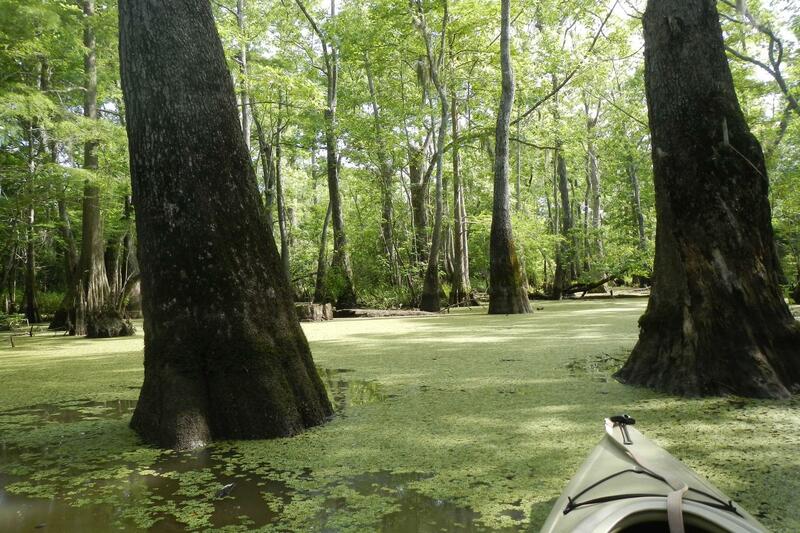 Paddlers will encounter bald cypress and tupelo trees on a new trail loop through the Big Thicket in Beaumont. The Neches River is the main thoroughfare of the Big Thicket National Preserve. Superintendent Doug Neighbor says the Big Thicket is sometimes referred to as the "biological crossroads of North America." “It’s so diverse that you could be standing next to a prickly pear cactus, throw a rock, and hit a cypress tree,” Neighbor said. Neighbor has built three canoes, and he enjoys navigating the meandering Neches. The densely forested Big Thicket is 110,000 acres today. Walker says the original Big Thicket was more than one million acres. He says the goal of this event is to show people what a jewel they have in the lower Neches River, much like an event that is held on the upper Neches. “This is patterned after the Neches River Rendezvous that they have in Angelina County. The folks up in Angelina County and Lufkin have really helped us out in planning this event,” Walker said. Online registration for the first Neches River Rally ends Wednesday. Walker says advanced registration is required to participate in the paddle. The rally begins and ends at the Lower Neches Valley Association Saltwater Barrier boat launch in Beaumont. The new loop will be officially dedicated Saturday as a Texas paddling trail by Texas Parks and Wildlife. The Museum of East Texas in Lufkin will host a discussion Sunday about preserving the Neches River. The five authors on the panel have an intimate knowledge of the Neches, which flows more than 400 miles through East Texas. Stephen F. Austin State emeritus professor of English, Francis Abernethy, has penned a new book, “Let the River Run Wild!” Abernethy collaborated with Woodville, Texas, photographer and conservationist Adrian Van Dellen. The 88-year-old Abernethy says they spent nights on the Neches River to produce the book.